It’s been a few decades since I’ve had tequeños and I think I’ve been craving them that long too! They are a snack food that I enjoyed greatly when I lived in Venezuela. We used to go the bar after work and play Liars dice. Loser had to buy beer and tequenos. Me with Patty and John wrapping away. Liar’s dice, or Liar dice, with roots originating in South America and popularized in early Spanish History, was brought to Spain by the Spanish conqueror Francisco Pizarro during the 16th century. Liar’s Dice is known for being a game in pirate history, and a name for a class of dice games for two or more players. They are easy to learn, require little equipment, and can be played as gambling or drinking games. Playing them well requires the ability to deceive and detect an opponent’s deception. Versions of the game are known as Dudo or Cachito in South America. The equivalent drinking game is sometimes called Mexicali or Mexican in the United States; the latter term may be a corruption of Mäxchen (“Little Max”), the name by which a similar game, called Mia, is known in Germany, while Liar’s dice is known in Germany as Bluff. There are at least three different versions of Liar’s Dice; it’s uncertain which version is the original. In all of them, dice are rolled in a concealed fashion and bids made about the result of the roll. Players must then either raise the bid or challenge the previous bid in turn. Keeping all the cheeses organized. Rear left, are the first fried tequenos. Mary and John were coming to visit, so I took the opportunity to finally fulfill this craving by researching recipes. In the process, I found that getting the right kind of cheese might be an issue. But, after going to several grocery stores, I was able to get four recommended types to try. The cheeses were: Farmers [this version was to bland], Queso blanco [this one didn’t melt], the other one was a Mexican frying cheese and Quesadilla cheese. Turns out, the best of these was the Quesadilla Cheese I picked up at Cub Foods. I still would like one with more salt and flavor. The key is to get very salty cheese. Assembly was a completely different issue. Getting the cheese thoroughly wrapped in the crust was difficult. We ended up using a spray bottle of water to keep the dough moist as we worked, and we made sure to cover any holes where the cheese showed through. It was in Venezuela that I purchased a really beautiful gold watchband with 3 kinds of gold and cultural symbols on it. Apparently, this is what Patty first noticed about me when we first met at a bridge-playing event. The rest is history! Just as good as I remembered! Here is a video that helped a little in the wrapping technique used by the pros, at the 52 second marker you can get a good look. Roll the dough very thin and mist with water so it doesn't dry out. Combine the flour, oil, egg, salt and sugar in a bowl. Mix with your hands and add some water. At first it just makes a mess, but as you knead it it starts to take shape. 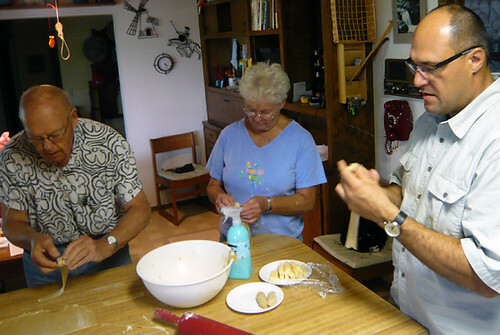 Keep kneading until it does not stick to your hands. Add more flour or water as needed. Let the dough rest for 1-2 hours . While the dough is resting, cut the cheese into strips into a finger-like shape. They should be maybe 1/2″ by 1/2″ by 3″. Don’t make the”fingers” too long, or they will be more difficult to use later. After the dough has rested, shape it into balls slightly larger than your fist. Roll them out until they are 1/4-0.125 inch thick. 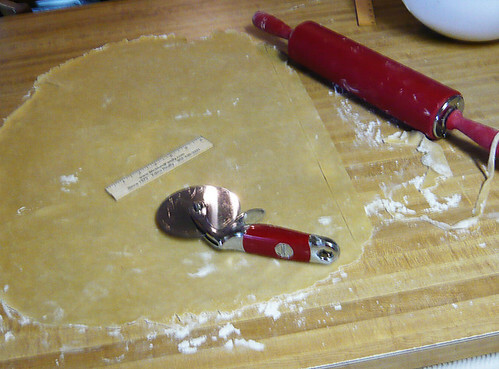 Cut the rolled-out dough into long strips that are 3/4″ wide. Wrap the cheese”fingers” with the dough strips. Make sure you cover all the cheese and seal the dough, because otherwise the cheese will leak out of the dough when you are frying it. 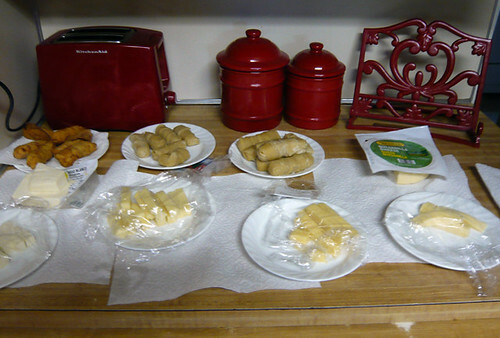 After you have wrapped the cheese in dough, dust the uncooked tequeños with flour and fry them in oil. Cheese, wrapped in dough, and fried? The Belgians will like these for sure. I’ll have to make some. Thoughts on a dipping sauce? No dipping sauce! I’m from Colombia, where they’re called “deditos” (little fingers) and if you have the right recipe (mostly, the right cheese) these are best warm on their own. Marinara is great for bland (rich and still delicious) mozarella sticks, but deditos are best on their own. How is it that Wisconsin hasn’t claimed this as their state food? That looks soooooooooooo yummmmyyyy!!! I am going to have to make them!!!!!! Great snack food! But, who’s diet can afford them? Deep-fat fried cheese in dough…..no wonder I never made them! I must admit, though they tasted great with beer! 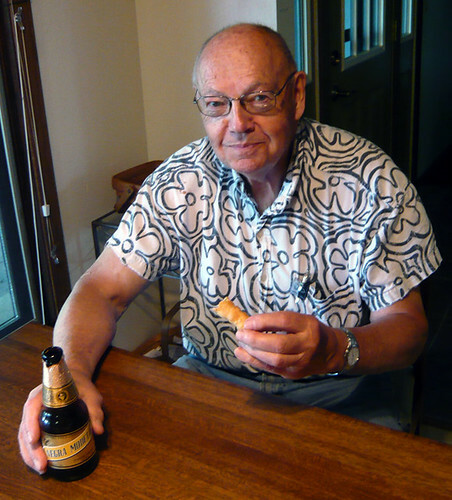 Good times….good times….and tasty vittles. man these look great and recipe and instructions are great, will have to give this one a try for sure! As a Venezuelan, I’m always excited to see tequenos featured anywhere. The challenge I always have in the US is finding the right cheese (as you mentioned yourself). I find buffalo mozzarella to be most like the Venezuelan cheese used in tequenos, but who can afford that in large quantities? I usually go for a fresh, Mexican queso fresco, but it’s always a distant second. Fried cheese you can never go wrong. I bet these would be great in spicy salsa. Wow, thanks for reviewing the 4 cheeses for us. It’s frustrating when you know what taste you want but can’t find the perfect ingredient. The tequenos look beautiful though. Oh my heavens! You had me at “fried dough” & “cheese”. Must have Tequenos now!! Let’s see .. dough + fried + cheese = heaven. I bet these would be good with a nice garlicky sour cream! Oh wow, my kinda food. If you’re looking for a cheese with more salt, how about trying haloumi cheese? I just went back to my childhood in Venezuela with your post… My nanny use to make these all the time (after school snacks!).. they were a staple in my birthday parties (actually in any birthday party). And you are right the most challenging aspect of duplicating this recipe here is the cheese. I have used also the Mexican Queso Blanco, and since our version is a bit saltier, I tend to spray a bit of salt when I’m wrapping them in the dough. What a great tip – next time I’ll dilute a little salt into the spray bottle. Thanks! Whoa. 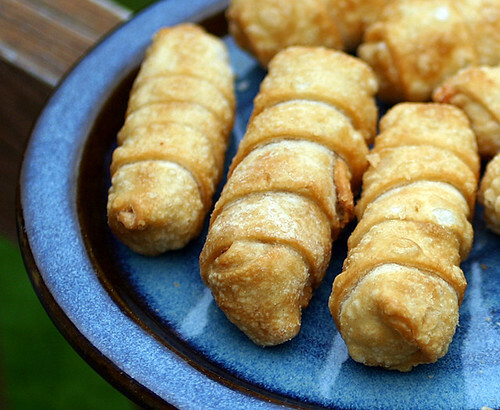 I’ve never heard of tequeños, but they look utterly fantastic and similar to egg rolls! I want to make this soon! Great photos. Wao, se ven deliciosos!!! me encantan los tequeños pero es muy dificil conseguir el queso correcto. Yo vivo en Alemania y a pesar de la variedad de quesos que hay, no he podido conseguir uno bueno para los tequeños….. Ademas todas las recetas que estan aqui se ven deliciosas! Sounds like a lot of work. They look good though. I guess you have to investigate good cheeses for this. THANK YOU for this info Sandra, it’s greatly appreciated! I’m planning a dinner party with a “Latin” feel so these look perfect as a starter. I’m from australia so the right cheeses here may or may not be available. Do you think a salty greek fetta would do the trick? Guasacaca looks like a delicious guacamole! I also spent time in Venezuela (1960-1974). Yours is the only mention of the gold watchband with 6 panels and 3 colors/cultural symbols I’ve heard in a long time. I’m wearing the one I inherited from my father H.B.Watson. Saludos y gracias por hacerme recorder que tan sabrosos son los tequeños. I just made some shrimp wrapped and deep fried in wonton skins. I had some hard hot cheese and decided to try this. My husband who spent time in Venezuela as a child said that they reminded him of tequinos. They were very good but cheese was not gooey. Can i bake the tequenos or would that ruin the taste? I have no idea, if you do happen to try it – let us know how it worked out. Gonna try your recipe. I did make empanadas a while back. Tried two different cheeses; one actually tasted like queso de mano (salty) and melted well (the cheese that leaked even got all brown and crispy just like the tequeno cheese) . Your recipe looks like it makes enough to freeze; I like that! Gonna try your recipe. It’s the first one I’ve seen that looks like it makez enough to freeze! And that is important!